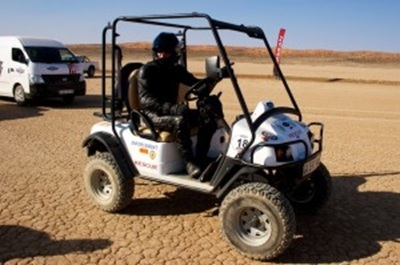 So, you’ve probably heard of Speed Week where you can scream your vehicle down a 5 km dirt track at Hakskeen Pan in the South African Kalahari desert? 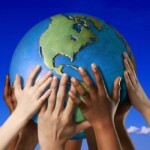 What you may not have heard of is “eco speed week,” where you can do the same but with your alternative fueled vehicle. Neither had I until late last year. 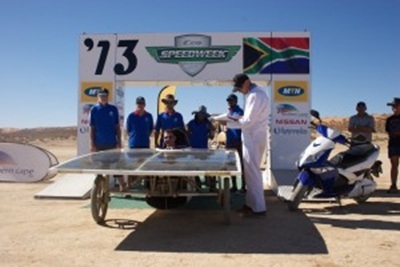 Bob Bond, of Tshwane University of Technology, had been trying to get this going with the Speed Week team, headed by Jan Els, and this time they invited ewizz and Melex to participate. 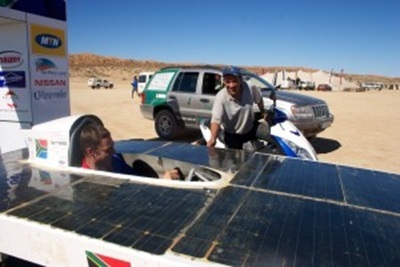 The ewizz / Melex team consisted of William “The Joker” Jantjes, an electrics wizard and RC enthusiast friend, Naveed “Crash” Maqbool the electrical lead for the UCT solar car and me, Andy Le May. With only a few brief conversations with the organisers, and this being the first event, we were not sure of the challenges we were going face, but we were sure it was going to be a whole lot of fun. Although about 8 teams were schedule to come, in the end we had three teams pitch. 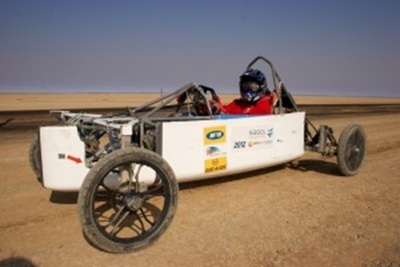 The two others were Bob Bond’s team from Tshwane University of Technology with their solar racer called car “Fire of the dawn.” Crash was particular interested in this as this is what we are working on with UCT and he has to do the electronics for it! 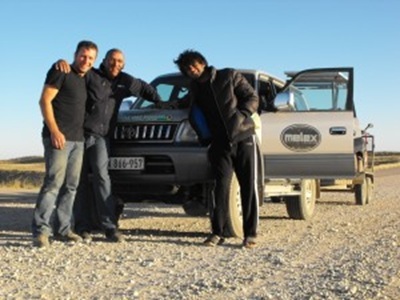 The other team was Daniel Kriel and Carel Ballack in a converted 2003 Jeep Grand Cherokee sponsored by the Copper Development Corporation. This had a BIG 36 Kwh, 600 Volt, 60 Ah Lithium ion battery pack. It was quite a machine! 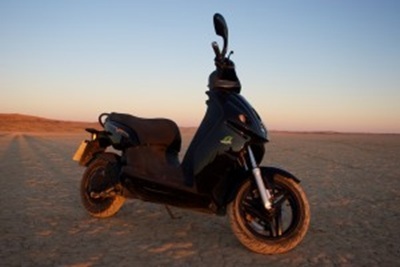 The “Range” scooter was the black vmoto e-max 120L, on loan from Imperial Green Mobility, with a 5 Kwh (extended battery option) 48 Volt 104 Ah Lithium ion pack. This was connected to a Sevcon Gen 4 48 Volt 180 Amp controller which is driving a 4 Kw BLDC (Brushless DC) motor. With the extended battery pack we were hoping for around 150 km. The “Speed” scooter is a two year old ewizz Thunder 5. This has a 2.9 Kwh 72 Volt 40 Ah Lithium Ion battery pack. The controller is a Chinese 72 Volt 90 Amp unit driving a 5 Kw BLDC hub motor. This ewizz Thunder 5 has done over 15,000 km and should get around 90 km/h. These BLDC motors are incredibly efficient and are built into the rear wheel, so there are no chains or gears to worry about. 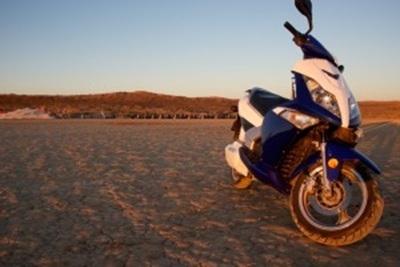 Less maintenance means more reliable, even in the desert heat and dust. The first event would be the timed run, or drag. All the vehicles have to be scrutinised to make sure they are safe to race. The duty of managing that fell to Anton Dekker, who was extremely thorough. Pretty tough job for him as he was dealing with a lot of very new technology. There’d been some playful exchanges between the teams, mainly by William “The joker” on our side. Johan had been claiming that they should be able to get 100 km/h from the “Fire of the dawn” and so a little banter and competition was in the air. After riding the ewizz Thunder 5 William was pretty confident that we should be faster, so his mouth was in overdrive. On paper it was pretty close. We both had 5 Kw BLDC motors, so power was pretty similar, we were running a higher voltage but they had a more powerful controller and more amps to play with. 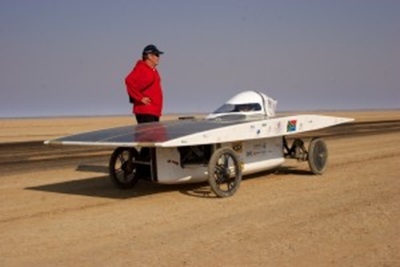 The solar car was very streamlined but heavier. So it was all to play for, game on! The next day, after some last minute adjustments, we all headed down to the start line. 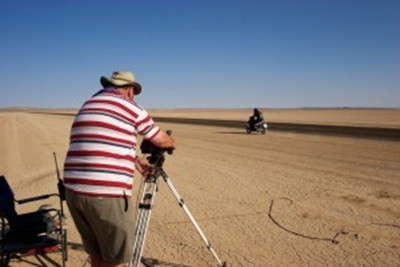 Theo Stander and Anton Dekker from Speedweek had kindly set up our start 1 km from the speed trap. There was no point us being 5km away like the gas-guzzlers because we weren’t going to be reaching 250+ km/h with these babies. First off was Carel and Daniels 4×4 they headed down the track and created quite a trail of dust so we knew they had done well. The official speed came over the walkie talkie 132 km/h yup we were all impressed! That’s what a 70 Kw motor can do for you. Next up was us with the Melex road legal electric golf cart. I was kitted out with the full race gear. This monkey suit was getting pretty hot so I was very keen to get going! The marshals had one last look at the cart and I lined on the start line and let her rip. The speedometer was telling me 60 km/h and the big wide tyres we had on her felt very stable even on this loose surface. There was no point ducking down or anything as the roll cage was causing quite a lot of drag. So through the timing area we went and I headed to see what we had done. 53 km/h, not bad for a golf cart. Now for the ewizz Thunder 5. I gave her full throttle and tucked tightly down behind the steering. The track was quite slippery with loose dust and dirty but she felt pretty stable all the same. I wedged my self back in the seat as far as I could and peaked through the top of the helmet. We were full out, the speedo was edging up tiny amounts and was nearly touching the 100 km/h mark as we went through the speed trap. The surface was pretty slippery so I slowed down carefully with the back brake only and turned round to go back to the timing tent. 89 km/h. Damn, the speedo was definitely near 100! Ah well let’s have another go! This time I thought I’ll lie on the bike head first with legs out the back to see if this reduced drag, this later became known as the spatchcock chicken pose, so named by the timers. I got up to 90 km/h quite quickly but to get the “spatchcock position” I’d have lie flat. I edged back as far as I could but needed to get further back to really get flat. So I pushed back on the steering. As I did I hit a patch of soft stuff and the bike started a very scary speed wobble. Rather than being neutral on the bars I was now pressurising and the steering started oscillating was harder to dampen. Luckily it didn’t escalate and I got her back under control and though the speed trap we went. I couldn’t see the speedo as my head was right down. We got to the timing tent and did the interview again and waited for the time. I was really hoping for some improvement. Again 89! Bugger, so much for Spatchcock! We’d set the starting point, but had we done enough to beat the Tshwane team? I got back to the start line to find them putting the finishing touches to their car. They had all the fairings and cowls on now and it really looked very streamlined. Their driver “Sputnik” was feeling a bit unsure of the surface and set off carefully. She was definitely off the pace and perhaps just feeling out the track on this first run. I can’t remember the exact speed but it was about 55 km/h. Back she came and off for a second run. This time she got about 60 km/h. You could feel a bit of tension in the team, there were a few words exchanged and talk of driver changes but she assured them she was getting there and that she wanted another go. So Sputnik lined up at the start and this time she went for it. You could clearly hear the pitch of the motor climbing much quicker from the start and she was creating a good dust train behind her. So what was the speed? Earlier, while drinking, the team was talking about 100 km/h. The radio crackled and Theo announced it was 75 km/h. The team were a bit disappointed. 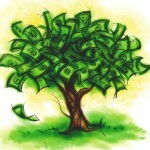 It was time to “Make a plan”. They removed the large aerodynamic solar panel wing leaving the basic car below resembling something out of the earlier days of formula 1. Their plan was to see how fast they could get with just the battery pack and with potentially less drag from the wing. Again Sputnik lined up and headed off at full tilt and they we all waited for the result. Over the radio it came, 75 km/h. This was quite funny because we had tried a different aerodynamic approach and for us it had made no difference either. So that was that, 4×4 first, scooter second and solar car third though actually we were all racing in different categories.